What are "Segmental Retaining Wall Blocks"? 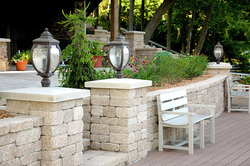 Segmental retaining walls consist of concrete masonry units (e.g. blocks) and provide superior engineering over many other methods. They interlock mechanically and rely on their own mass to prevent overturning and sliding as they retain gravity. They are designed to be installed without mortar. Therefore, they provide a structurally sound alternative to retaining walls built from timbers, railroad ties, poured concrete, or other types of wall materials that eventually deteriorate due to the effects of gravity, force, and weather. Why are they superior to other alternatives? 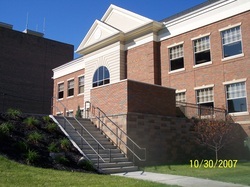 Compared to wood and poured concrete, our segmental materials offer many benefits for building retaining walls, egress window enclosures, patios, walkways, columns, steps, etc. Our masonry applications are virtually maintenance free unlike the alternatives. Wood decks that need staining and sealing each year. Timber retaining walls sag over time. Poured or stamped concrete cracks over time. If damage does occur for some reason then the small section can be easily replaced with minimal cost. 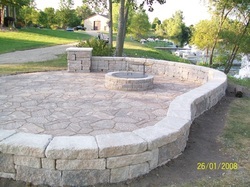 Professional grade masonry materials have a long lifespan. When professionally installed they do not sag or heave over time, even through the freeze and thaw cycles. Professionally installed brick hardscapes convey greater permance, quality, and value to a potential home buyer. Quality landscaping can add 14% value to your home. You can make the investment now to enjoy while you live in your home. A quality job will last far into the future if you decide to sell. "With the unique construction of segmental retaining walls, higher and steeper walls can be constructed with the ability to retain the force of lateral earth pressure created by the backfill soil," according to the Concrete Network.